Great interview, really interesting, Chris. It's not easy to get the voice of the interviewee sometimes, but you've done it, and the whole things was interesting. Good questions, good answers, and a fun look back. Way to go, and thanks. Great post and interesting read. 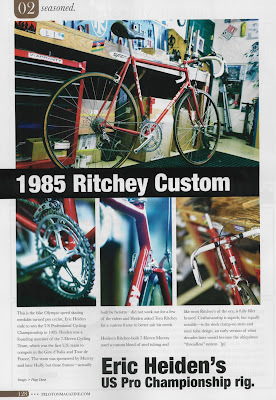 The amount of frames Ritchey personally built is incredible. The early age of his involvement is even more so. 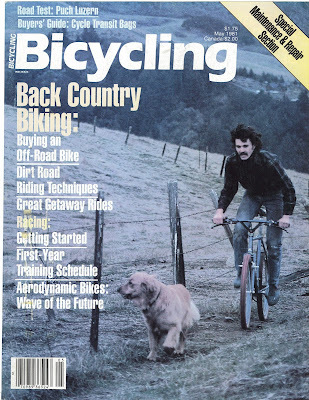 I still have that Bicycling magazine with Ritchey on the cover. 1981 !! Great post, Chris, and thanks for sending me the link. I enjoyed this thoroughly. Tom has amazing talent and what a prolific builder! That part still blows me away. Because of that cover story in the spring of 1981, I ordered my custom Ritchey a couple months later. It cost more money than I had to my name, but I had a new job for a non-profit overseas. I had the bike shipped to me in Thailand. It arrived in early Spring '82. 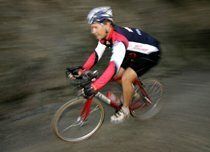 I rode it for the next 30 years in Asia, until it was stolen a few years ago. I'm still in denial -- and still looking for an 80-82 built replacement. LOVED the Interview. Very well done. Thanks for posting it. From Sal Ruibal: I must admit that my knowledge of the technical side of frame construction is lacking, but it doesn't take a welder's mask to see a great human interest story. 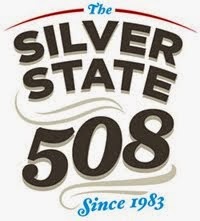 The rumblings of the early days still echo in our business with old rivalries and wounds still as raw as in the 1980s. It is that intense competition that, to this day, fuels the innovation that creates such marvelous machines. Thanks for a small peek into that red-hot cauldron of creativity. 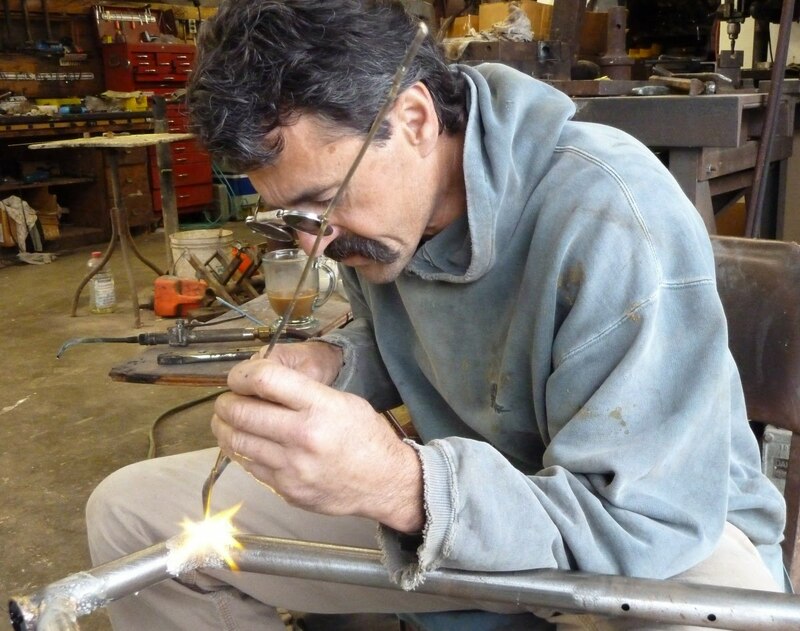 A comment on the Specialized Wikipedia info Tom comments on-The first several containers of Stumpjumpers were indeed tig welded and many of these are still out there. I recently acquired several examples from the 1st container for the Specialized Museum. 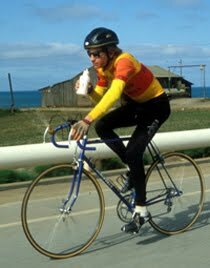 There were some very early handmade lugged bikes hanging around Specialized, such as the Jim Merz made lugged bike Mike Sinyard rode. This bike still exists at Specialized. 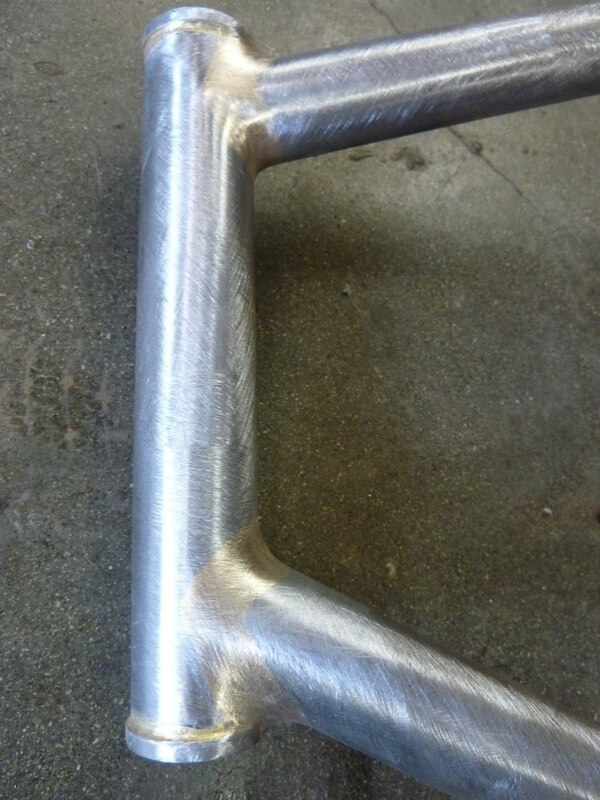 Production of lugged Stumpjumpers did not occur until 1983, when lugs fork crowns were created. 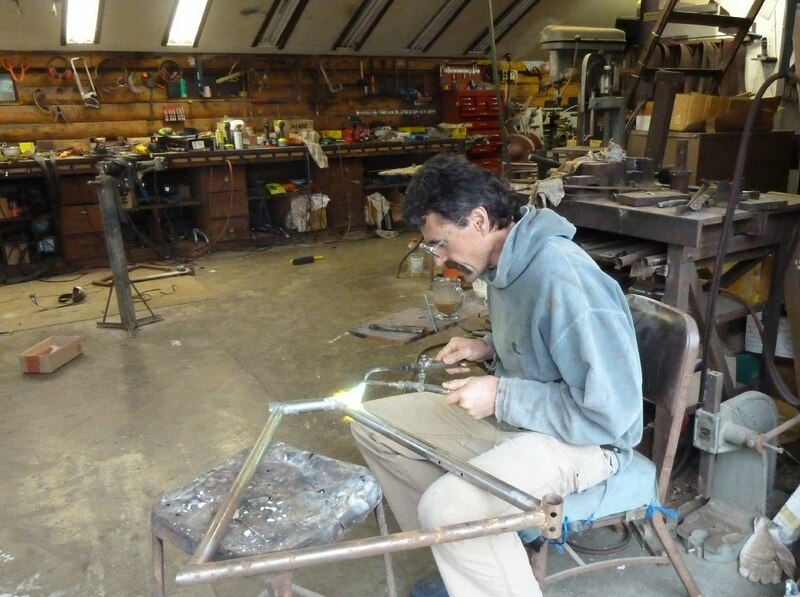 One of the photos shows Tom building a road frame....is he building frames again? Great piece- thank you for posting. One of the coolest racing bikes in existence is the one Tom built for his father in 1974. Thought-provoking, minimalist, purpose built. A stunning example of his pure design brilliance. 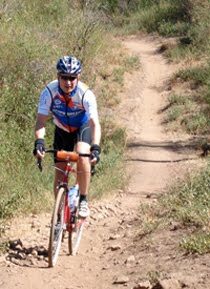 I moving to San Diego this summer, comin from Missouri where I ride nothing but gravel and cross. 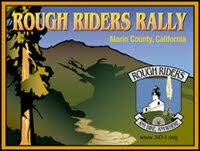 Really excited to know that this kind of riding happens in CA. 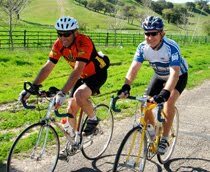 I'd sure like to start some comms with overly juiced guys who love to ride so when I get there I can hit the gravel runnin. 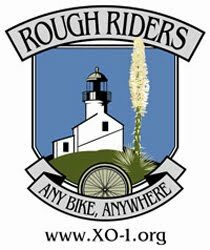 Biggest race I do here in the midwest is the Dirty Kanza 200. 200 miles in the Flint Hills of Kansas. Big prairie, hills and cows as far as the eye can see. Radio tower here and there to give it some scale. I've owned a buncha Ritcheys. 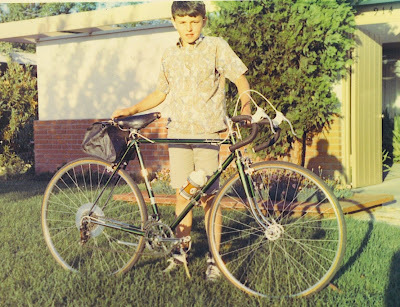 And my then girlfriend/now wife had a road frame, too. 1. The lugged one was one he made for the Palo Alto Bike Shop, then a hotshotshop (may still be, I dunno). They were Reynolds, lugged, and undecaled, but I got the decals and put them on. I hear Jobst Brandt had a hand in designing the decals. 2. Before I got that frame, the fastest local guy in our club, Rick Baldwin, had three, with the fillet stem and all. 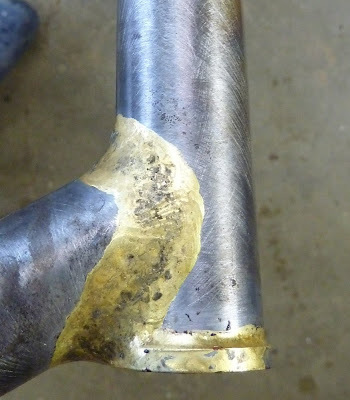 One was a criterium bike, with fork crown points on the outside that extended halfway down the forkblades, all the better to stiffen the forks more, to resist high g-forces in criteriums. Mostly it was Tom showing off, and he had a right to, and did it well. 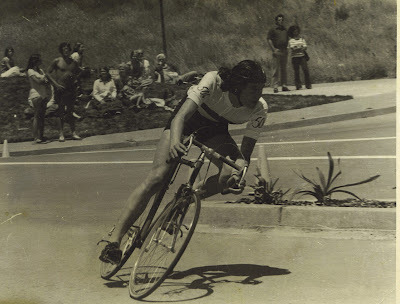 This bike was a 5-speed, and I saw Rick outsprint Greg Lemond to win the Berkeley Criterium in '77 or '78. 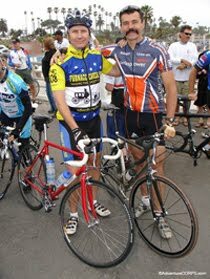 Greg then was riding Junior gears, and Rick probably had a 53 x 13, but even so, it was impressive, and the last time I saw Lemond race and not win, and I saw tons of wins. 3. My custom was made of Columbus SP tubing and had a fillet stem. The frame was purplish and the stem was green. 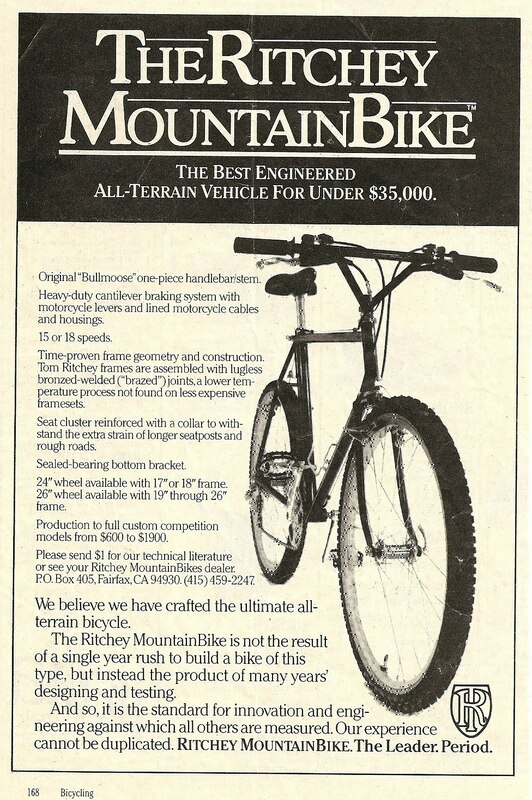 I stretched my budget by ordering that and the tandem at the same time, in '80. I made time payments on them both and paid them off in '81. 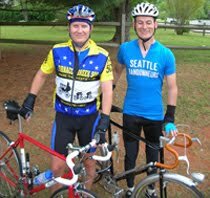 The single cost me $500, and the tandem was $1200, and had the most extensive lateral and cross bracing you could ever imagine. It was as though he was looking for ways to increase his work, but it was a beautiful frame. 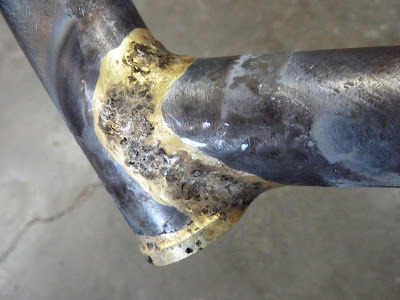 The tubing was straight gauge unbranded CrMo with the same 1.25 downtube and 1.125 top tube and 1 headset that used to be considered oversize, and that Riv still uses today. There was no noticeable wiggle in the frame, even though these dimensions would be considered way too skinny these days (by anybody except JHeine). 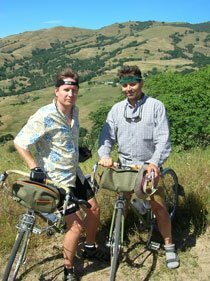 If we ever do a tandem, we'll likely do the same. 3. 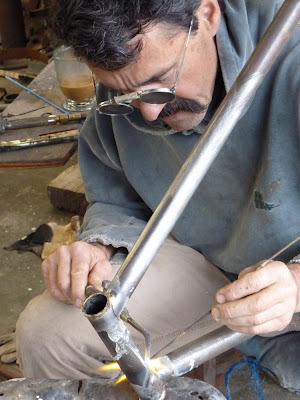 When I was ordering my custom, I asked Tom, "Should I get short reach or standard?" Short was the rage and I didn't want to be left behind. Tom said, "Get regular, it's more useful. More clearance. 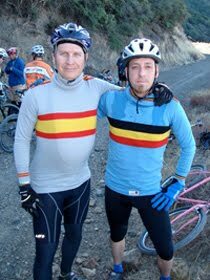 Short is for specialty bikes." Now "short" is "normal", but it's still as limiting as it was then. 4. I could fit 32mm tires, easily. 5. 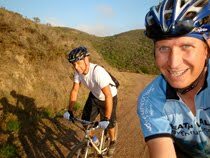 On the tandem, Tom tried to talk me into sidepulls, but I held out for cantilevers. Tom probably didn't brake as much as I did. 6. I put a TA triple on the tandem, 54 x 49 x 32, and used an outer ring f or the middle. If you did this you could bolt the middle and outer ring together, stiffening the rings. It was one of those insider tricks of the day. 7. I ordered my custom mtn frame way too small, but what did I know? I got a 49. Low bb, steeper angles than normal (73 seat 72 head), and with 126mm spacing instead of the std (of the day) 130. He built it at 130. I called him about it, and expected he'd spread it, but he said, "I'll have another one to you in a week," and he did. 8. There wasn't QUITE enough tire clearance, and Tom said, "Bring it by and I'll fix it." I brought it by, he put the chainstays down on a wooden bench, on the inside of the chainstay he placed a mallet of some kind probably shaped to do this, and whacked it super hard three times with a big hammer, as I watch and listened afraid of the damage and afraid to look. Then he repeated it on the other side. 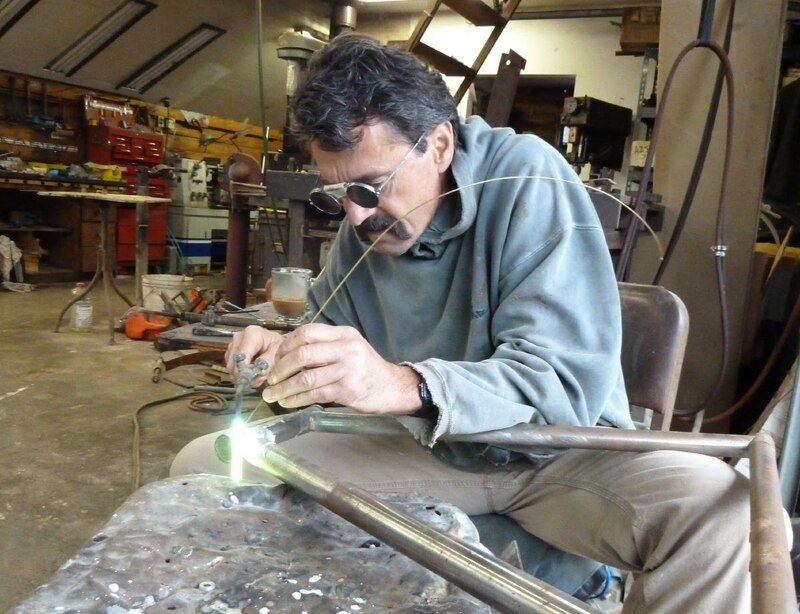 It made a good case for steel tubes. 9. 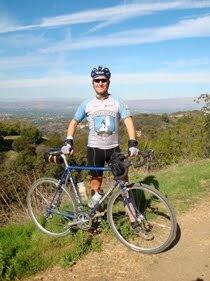 The custom mtn frame I returned with the 130 was used to win one Nat'l Championship, and then another guy rode it to many top finishes. I saw it in the race photos. It was cream frame, blue seat tube panel. 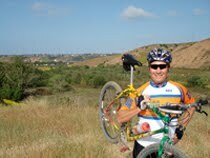 Tom was by a few months ago and rode a 62 Hunqapillar with Alba bars in the local hills. He was a strong influence for many years. 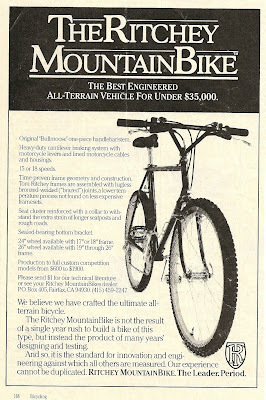 I don't mean to say I'm beyond that now, because there isn't any "beyond" Tom Ritchey when it comes to bikes. He and his company are on a different path than we are, but I've always liked Tom and I always look forward to seeing him when he stops by, a couple of times a year by surprise. Thank you very much. Fantastic. Great information in all the posts. Beautiful photos and amazing swag... jerseys and head badges. Keep up the good work and keep me on the mailing list. I'm not sure whether Tom will read this, but if he or anyone else would like to help me improve the Wikipedia article, then please do post a response here. 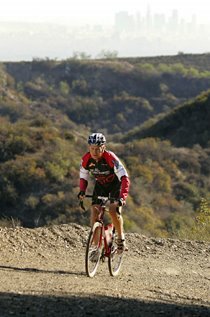 Thanks loads for Tom Ritchey, in His Own Words. I purchased a new Road Logic in the early or mid 90's. I still have it and ride it and it still looks great. 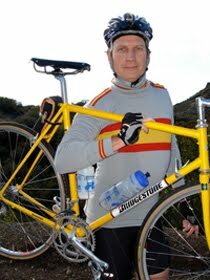 Indeed, it is a wonderful riding bike ( no hands, easily) and that's why I kept it all these years. BTW, all Campagnolo Record and Chorus components. Thanks again. Hey Thanks for this great interview. I have a 54cm Ritchey Road Classic that I picked up in Salt Lake City. 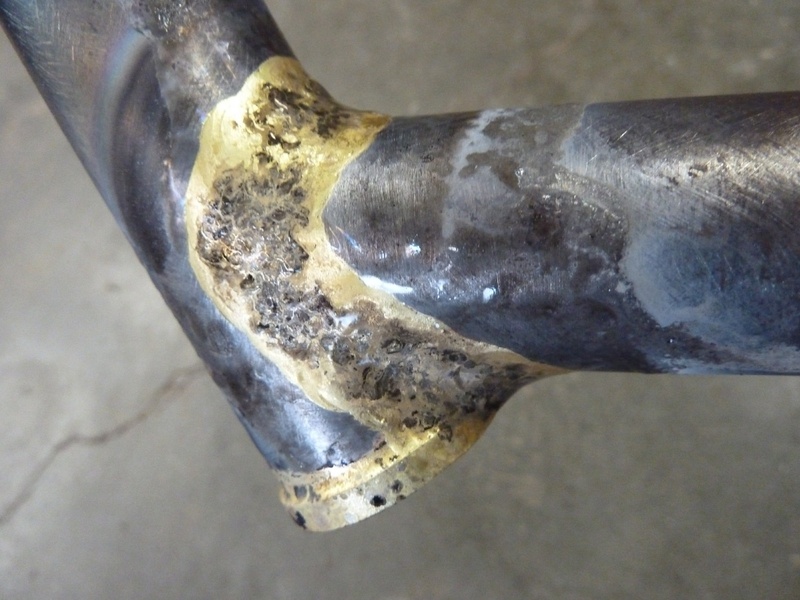 It is fillet brazed and has a decal for both logic tubing and for being handbuilt by Tom Ritchey. The Serial # is RC54 1006. 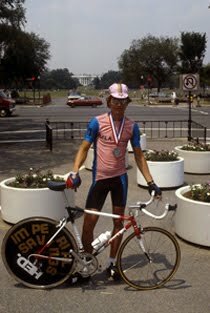 Is there ANY way that you can tell me to verify this bike as being handmade by Tom and what year this bike is? It's in beautiful condition. Wow..The first five photos really show the great and excellent job. 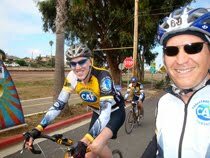 Nice work Tom Ritchey, the 62cm road shown in the fourth and fifth photos really looks strong. 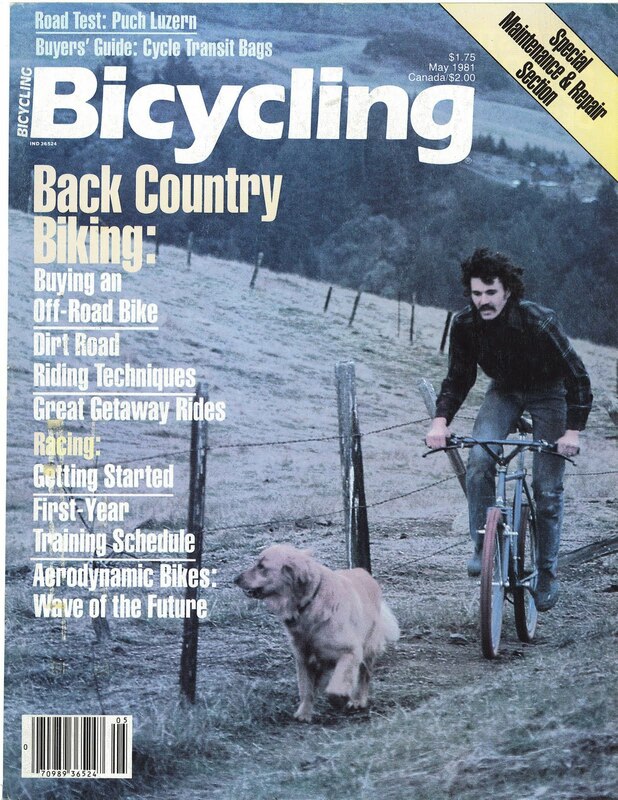 The May 1981 Issue of Bicycling, with Tom on the cover on his mtb, changed my view of the world. I ordered one, even though I had nowhere near enough money to pay for it. Fortunately, by the time it was ready I had saved (just) enough to pay for it. Greatest bike I ever owned.